These companies are benefiting from the current low interest rate environment. Low interest rates won't be around forever. The timing is anyone's guess, but the days of ultra-low rates will at some point come to an end. Before that happens, take a look at Ellie Mae (NYSEMKT: ELLI), General Motors (NYSE:GM), and Enterprise Products Partners (NYSE:EPD). Brian Feroldi (Ellie Mae): Record low interest rates have caused many homeowners to run down to their local mortgage professional's office to try to lock in a lower payment. To keep up with the surging demand, more and more mortgage originators have become customers of Ellie Mae's software-as-a-service platform -- called Encompass -- to help them automate as much of the process as possible. 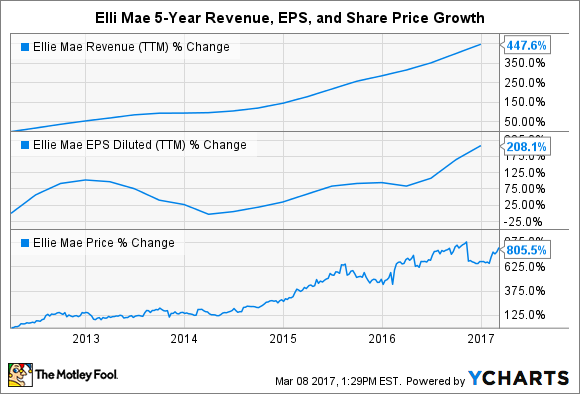 In turn, Ellie Mae's revenue, profits, and stock price have all soared. Ellie Revenue (TTM) data by YCharts. With interest rates poised to rise, there's a legitimate concern in the air that mortgage origination volumes will fall. If true, that might make it harder for Ellie Mae to keep up its hyper growth rates. Despite the potential headwinds, Ellie Mae's management team doesn't seem to be worried. For the full year 2017, the company's executives are guiding for sales growth of 21% at the midpoint. That's quite a bullish forecast given the backdrop. Why is management so confident in its growth prospects? The company's Encompass software provides solutions to an ever-expanding number of needs. Currently, Encompass can be used for underwriting, customer relationship management, document signing, title searches, loan processing, and more, all while remaining compliant with local regulations. That's an attractive product offering that competitors are finding tough to beat, which is why Ellie Mae has been gobbling up market share for years. While higher interest rates could put a small dent in the company's growth prospects, Ellie Mae software still looks poised to become the industry standard. If that's true, Ellie Mae should be able to drive profit growth regardless of where interest rates go. Tim Green (General Motors): The vast majority of new cars sold in the U.S. are financed, which means higher interest rates could have a negative effect on the automotive market. U.S. automobile sales are already showing signs of leveling off after years of growth following the financial crisis, and a rise in interest rates could send sales lower. General Motors, as well as every other automobile manufacturer, may run into trouble if customers balk at higher financing interest rates, opting for a used car or a delay in buying a new car instead. The overall strength of the economy, wage growth, and unemployment will also be major factors, so predicting sales in a rising rate environment is mostly a guessing game. But a sales decline for GM in the coming years seems likely. The good news for investors is that GM stock is cheap, even factoring in the risk of a drop in earnings. The company expects to earn as much as $6.50 in adjusted earnings per share in 2017, putting the stock price at less than 6 times earnings. 2017 may end up being the peak year for GM's profits, so this low PE ratio is a bit deceptive. But the stock looks cheap even assuming a dramatic decline in earnings. Tyler Crowe (Enterprise Products Partners): The past decade or so have been the ideal conditions for master limited partnerships. Shale drilling in the U.S. has created a massive demand for a wide range of new oil and gas infrastructure. If that wasn't enough for a boom, low interest rates have meant that companies have had incredible access to capital to build out that infrastructure at relatively cheap rates. The recent downturn in oil prices was a great example of many master limited partnerships putting themselves in situations where they were wholly reliant on growing at a rapid pace to keep up with interest payments and distributions to shareholders. Once that growth rate declined, though, there was a pretty large contingent of MLPs that were forced to cut distributions and reconsider their growth plans. Rising interest rates could have a similar effect on the industry. Higher interest rates mean the rate of return on new assets must be higher to justify an investment, and lower return projects on the books will be less attractive once those debts need to be refinanced at higher rates. For some, this could spell trouble, but it will be much less of an issue for Enterprise Products Partners. On top of the company's investment-grade credit rating that keeps borrowing costs lower than for many of its peers, management has been rather good at securing those debts with maturity dates well into the future, which prevents the need to refinance in a rising rate environment. More than 75% of Enterprise's debt has a maturity date of 10 years or more, and 43% of that debt has a maturity debt more than 30 years into the future. Locking in lower rates over such long periods of time will be a much-needed tool when riding out rising interest rates. With a distribution yield of 6% and a history of growing its payout by 5% annually or more for close to two decades, Enterprise looks like a long-term investment that can use this low rate environment to lock in low rates for decades to come.